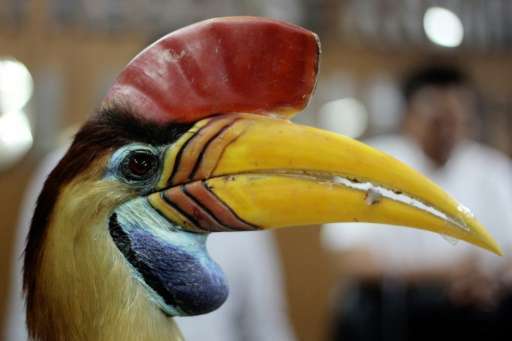 A striking bird with monochrome plumage and a formidable "beak", the helmeted hornbill is being hunted to extinction, one of the latest victims of a thriving global trade in exotic wildlife. For decades poachers in Borneo's western forests focused on capturing orangutans and sun bears, but in the past few years a surge in demand for hornbill "ivory" has pushed the avian species to the brink. The product has become so popular in China, where wealthy collectors are keen to show off their status by acquiring rare or unusual animals, that it is fetching up to five times the price of elephant tusk on the black market. "The demand for these luxury items is just going through the roof," Chris Shepherd, from wildlife trade watchdog TRAFFIC, told AFP. "In Asia, it's really at a scale where species like the helmeted hornbill are just being completely decimated." Poachers aren't interested in their brilliant plumage or large bills, but a helmet-like block of reddish-gold keratin at the front of the skulls known as a casque. It's this soft, ivory-like substance that's carved by craftsmen in China into luxury ornaments, statues and jewellery—trendy top-shelf trinkets that have soared in value as so-called "red ivory" has grown more prestigious. Experts say a single casque can fetch up to $1000, eclipsing the average black market price of traditional "white" ivory sourced from elephant tusk several times over. Researchers say thousands of these majestic birds have been killed in half a decade alone as demand for red ivory has taken off. Yokyok Hadiprakarsa, a leading expert in helmeted hornbills, estimates as many as 500 were killed every month in 2013—or 6,000 annually—just in West Kalimantan, a jungle-clad province in Indonesia's half of Borneo. Helmeted hornbills had been traditionally hunted in the past by Borneo's indigenous tribes, but never at levels that posed any conservation risk. This "complete, systematic slaughter of the species" came virtually out of nowhere, Shepherd said. It wasn't until 2011 that red ivory first began showing up on websites catering to Chinese buyers and at high-end wildlife markets along the country's borders, such as in Myanmar and Laos. 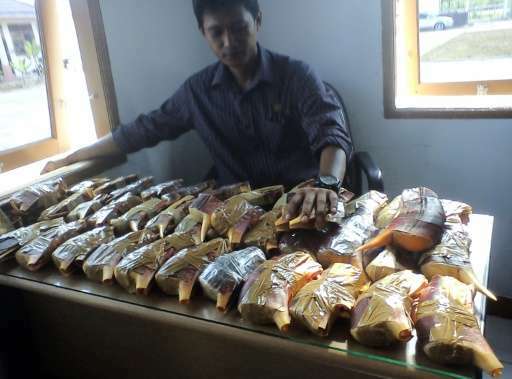 Hunting rapidly intensified, especially among trafficking networks already well entrenched in West Kalimantan, a key wildlife smuggling hub with an international airport in the capital Pontianak. By the close of 2015, the species had progressed from vulnerable to critically endangered—leapfrogging two threat levels to the highest possible risk category on the International Union for Conservation of Nature's "red list". Now the elite rangers of the government's Forest Police Rapid Reaction Unit (SPORC) rarely spot these distinctive birds during jungle patrols, SPORC commander David Muhammad told AFP in Pontianak. Instead, they're uncovering just the skulls during raids on smuggler hideouts, the decapitated corpses dumped unceremoniously elsewhere. "There is a high value placed on the heads by hunters and collectors," said Muhammad. "That's the only thing they want. The rest has no value." The commercial trade of helmeted hornbills is prohibited by law in China and across its habitat zones in Southeast Asia: Thailand and Myanmar, as well as Malaysia, Brunei and Indonesia—the three countries that share Borneo island. But the rate of seizures—a "tip of the iceberg" indicator of the trade, said Shepherd—suggests business is booming. In the 18 months to August 2014, nearly 2,200 casques were confiscated by law enforcement in China and Indonesia, around a third just in West Kalimantan. In one case, SPORC units intercepted four Chinese nationals at Pontianak's international airport with nearly 250 casques stashed in their luggage. 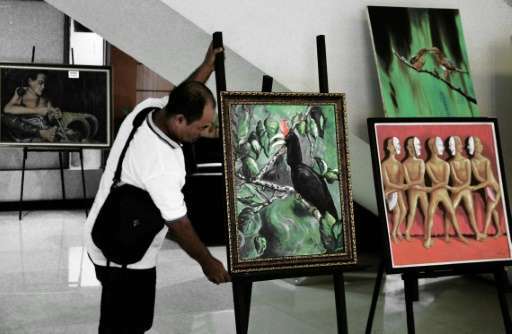 Adam Miller, of Pontianak-based conservation group Planet Indonesia, said the smuggling of hornbill ivory bore many similarities to the elephant ivory trade in its scale, criminality and sophistication. "There's a lot less people doing it just to survive. It's very much a gangster activity," he told AFP. 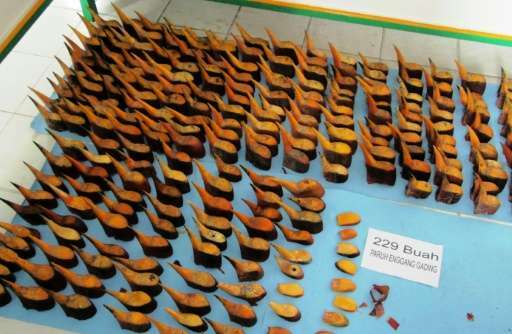 Many traffickers are caught not just with hornbill ivory but a host of other exotic specimens. A man arrested in Hong Kong in May was carrying more than $1 million worth of ivory and hornbill casques, while two Malaysians detained in the United States in December were smuggling both hornbill and orangutan skulls. Shepherd said this reflected a growing trend as collectors seek ever-rarer and more exotic wildlife not for use in traditional medicine but purely as status symbols. "People want to have illegal animals, people want to have rare animals, people want to have expensive animals, just to show off their status and their wealth," he said. There was a glimmer of hope for the hornbill this month when governments vowed to step up protection efforts during a meeting of The Convention on International Trade in Endangered Species (CITES), the global conference that governs wildlife trade. In West Kalimantan, the extinction of this iconic bird would also have far-reaching cultural ramifications. The helmeted hornbill is revered by ancient forest-dwelling Dayak communities, and its image adorns flags and sigils across the province. "It's a symbol of our customs, and we must protect it," Sustiyo Iriono, the head of the government's conservation agency in Pontianak, told AFP.